Berlin is perhaps the most important city of the twentieth century but it has been divided almost since it came into existence. It could be argued that there has always been a “wall” of sorts running through it, splitting the different ideologies that existed in the city and in Germany itself. 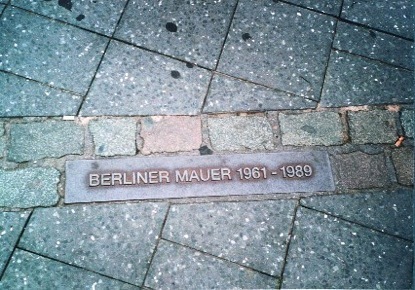 The Berlin Wall is a unique piece of material culture from the Twentieth Century. It divided a city, a nation and the world and became a symbol of the Cold War. This metaphorical and literal divide between East and West caused the two halves of Berlin to grow and prosper at different rates and the legacies of the divide can still be seen today. This work will examine the Wall itself, its make up and how it incorporated existing architecture as it grew in size and stature, altering the landscape of the city. It will examine, with the use of specific examples, how the Wall’s existence affected the city’s architectural and memorial landscapes showing how the two sides differed in their approaches to acceptable architecture and to the monuments of Germany’s Nazi past. For most of the twentieth century Berlin has been a city of contention. It has been both a conflict and a contested landscape. At the end of the First World War Berlin was a hotbed of political activity caused by the breakdown in government after the Kaiser abdicated. Conflict raged between the two World Wars and once the Second World War ended the city was divided again, this time into 4 parts. The Wall erected in 1961 split the city officially for 28 years, 2 months and 28 days. It cut the infrastructure of the city in two and ran straight through buildings, blocked off streets, waterways and rail traffic. It split families apart and destroyed hopes and lives, (Hertle 2008: 7). Today there is a scar that runs right through the centre of Berlin that forms a landscape of memory, (Schofield et al, 2006: 22), a void in the middle of the urban fabric. But the Berlin Wall was not just a wall. Eventually it consisted of concrete, barbed wire, watchtowers, armed guards, minefields and the famous Death-strip, (see Fig 1). It was never a static structure and “the border defences were continually enhanced, extended and modified, and obsolete elements were replaced”, (Schofield et al, 2006: 23). The first generation of the Wall was started on 13th August 1961. By the time most of Berlin woke that day the East Germans were hard at work setting the first obstacles in place to officially divide the city, (Taylor 2006: 249). “First barbed wire and then concrete blocks were placed along the dividing line between East and West Berlin”, (Lansing Dulles 1967: 55). The Brandenburg Gate, one of Berlin’s most famous landmarks, was a focus for attention and tanks and armoured cars took up positions under the pillars of the monument. “Cement block posts were erected. Then a crude barbed-wire fence was reeled out, foot by foot, to the Potsdamer Platz”, (Heller et al 1964: 38). On August 14th the Brandenburg Gate was closed as a crossing point, allegedly only as a temporary measure, owing to the continuous protests from the crowds of West Berliners to the building of the “Wall”, (Hertle 2008: 38). The Wall was to form a new void on the war scared façade of Berlin, Many of the city’s streets were still in ruins and in the Soviet sector there had been little or no reconstruction in the 16 years since the end of the war, (Heller et al 1964: 37). With alarming speed these ruined streets began to be ripped up all along the dividing line between East and West Berlin. Roads were altered or blocked off, railway lines were destroyed or re-routed, deep pits were dug and all along the divide soldiers with fixed bayonets guarded the workers, (Heller et al 1964: 38). The landscape of the city was being altered by a war that was “cold” and it was the beginning of one of the most sophisticated and controversial barriers that the world had ever seen. 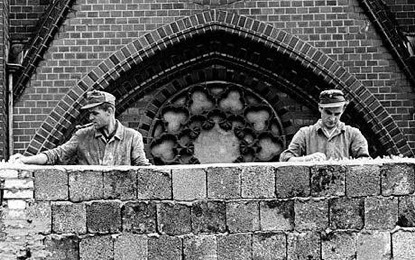 On August 17th 1961 the East Germans began to build the Wall in earnest. The barbed wire fence, which had been hastily erected, was never intended as a permanent barrier and gradually it began to be replaced by a more impenetrable structure in the form of a concrete wall. Eventually this wall would stretch almost two thirds of the way around West Berlin; the other third, in the semi rural suburbs of the city was left, as a wire barrier was considered suitable (Grant 1991: 72). This “First Generation” of the Wall was a fairly crude affair. It was mainly constructed from cinderblocks, approximately 8ft tall and topped with barbed wire. A person could still manage to cross the divide or a vehicle could be driven straight through the Wall and the effectiveness of the barrier still depended more on the guards than the physical obstacle (See Grant 1991, Heller et al 1964 and Taylor 2007). Although the Berlin divide was now in situ, it was not until later that the structure really started to savage the landscape of the city. In 1963 key stretches of the Wall were rebuilt in concrete and as the decade rolled on extensive construction was carried out on the divide. The structure became almost twice as high as the original obstacle. It was made out of concrete blocks held together with reinforced metal rods and behind the wall the “death strip” was created (Grant 1991: 72). This new obstacle was a truly terrifying and awe inspiring structure (See Fig 2). The width of the death strip depended on the areas through which it ran. At points it was as wide as 50m across, (Bevan 2006: 159) and at others the width of a road between two rows of houses (Hilton 2009: 30). Filled with defences such as guard towers and attack dogs as well as an anti-tank ditch running down its length, the area was constantly lit by large mercury lamps (Grant 1991: 72-73). It formed a No-Mans Land between the two halves of Berlin, a barren killing field in the heart of the city and refinements were constantly added including patrolling jeeps, tripwires, scatter guns and rumours of concealed mines (Hilton 2009: 30). 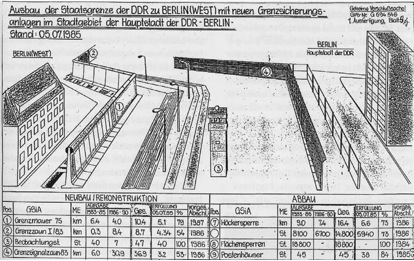 Often the Wall incorporated existing buildings into its makeup, such as the ones along Bernauer Strasse seen in Fig 3. This practice was fairly commonplace and many buildings that had been used as platforms for escape during the early stages of the Wall were at first bricked up and then destroyed, or made part of the Wall (Bevan 2006: 158, Grant 1991: 74). 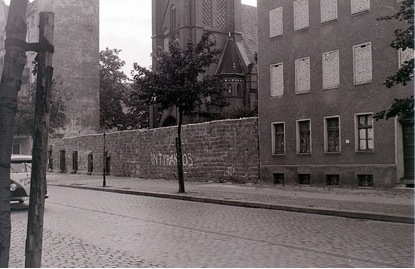 In the image Fig 3, taken in 1962, the wall and buildings are in East Berlin and the pavement is in West Berlin. Although the big changes came later in its life, the Wall was already starting to alter the layout and architecture of the city only a year after its construction had begun. Amongst the destruction and vandalism, ironically the opposite sometimes occurred. In places along the Wall’s length where it was felt by the GDR that a presentable face should be shown to the capitalist West, the fronts of buildings were often renovated, even though the sides and the rears of them had already been destroyed (Bevan 2006: 158-159). Other pieces of the city’s architecture, some still in ruins from the war were also incorporated into the Wall and the death strip, creating a modern palimpsest. Gravestones from the Hedwig Cemetery for example were torn up and used to pave the roads the jeeps used to patrol inside the death strip (Bevan 2006: 158), the markers of the dead used to pave the way for the death of many more. Saunders states that “fundamentally, war is the transformation of matter through the agency of destruction; the character of modern technological warfare is such that it simultaneously creates and destroys.” (Saunders 2004: 5). The Cold War managed to alter the landscape in many places in Berlin, without the use of heavy weaponry but the Wall was as much a weapon of modern warfare as was the artillery shell of the First World War. The Wall was bound to affect the architecture of Berlin and some of the city’s most famous buildings were either constructed or destroyed as a direct result of its existence. The Berlin City castle, the old Hohenzollern Schloss, almost completely destroyed during the war, was eventually demolished by the Soviets in 1950. It was regarded as a symbol of Prussian architecture and did not fit with the political and historical views of the Russians (Neil 2004: 98). In 1973 work commenced on the Palace of the Republic, what was to become the most symbolic building of the GDR, (Neil 2004: 73). The new building was to occupy the same footprint as the old schloss and served as the seat of the East German government as well as being open to the public. When the Wall came down the Palace was condemned by the new government, and blaming asbestos problems, was promptly destroyed. In reality it was a symbol of the wrong kind of history and like many other buildings before it was fated to become part of Berlin’s many layers. Perhaps the most renowned piece of architecture to have been destroyed by the Wall’s existence was the Church of the Reconciliation. When the death strip was constructed the church and part of its graveyard lay within its boundaries (See Fig 4). Soldiers exhumed the graves and the bodies were moved so that the death strip could be constructed, (Hilton 2009:30) and for some months after August 1961 a door was left in the Wall so that worshippers from the West could pass through it to worship, (Hilton 2009: 43). The Gothic Revival church was built in the late nineteenth century in an area of Berlin that was steeped in poverty. From the beginning the church was deeply involved in supporting the homeless and the unemployed, but as Bevan puts it, “Its proletarian credentials did not save it from the determinedly atheistic state”, (Bevan 2006: 159). The church was for many a symbol of hope, a house of God marooned for 24 years in a strip of hell on earth, hugely at odds with the message the wall portrayed. In January 1985 the East German authorities destroyed the church (See Fig 5). The reason given was one of security, but in reality it was a statement of political will. The church was one of the last vestiges of life and hope in the death strip and its destruction returned it to a totally barren land, reinforcing the permanency of the wall. Erich Honecker had insisted that The Wall would last for a hundred years, (Hilton 2009: 9), and although in reality by 1985 the GDR was already crumbling, the east German government wanted to make a statement to the world; that Berlin was to remain divided. However, the destruction of the landmark backfired disastrously on the East German rulers. The church was destroyed in front of the world’s media. The images were shown again and again on television sets around the world – a gross violation of hope, architecture and religion by a system widely perceived to be corrupt and inhumane. 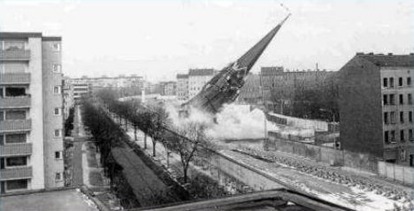 As Manfred Fischer, the parish’s minister, argued – the film footage of the spire toppling again and again demonstrated the true nature of the GDR regime, (Bevan 2006: 160). Fischer also argued that the sight of the church in the death strip was “less a symbol of reconciliation than the impossibility of reconciliation” (Bevan 2006: 160). Berlin is a palimpsest with layers of history and architecture piled on top of each other. “There is perhaps no other major Western city that bears the marks of twentieth-century history as intensely and self-consciously as Berlin”, (Huyssen 2003: 51). When the Berlin Wall was erected the rubble from the destruction of the city in the Second World War covered the streets, burying the Nazi era of the city, just as the Fuhrer- bunker and the beginnings of Germania were buried beneath the streets themselves. A new layer began to be created on top of the Second World War level. However on both sides of the Wall, “Many acres of war damage lay derelict for ages”, (Bevan 2006: 159) – the Wall slowing the rebuilding of the city. It was not just the rubble of the Second World War that covered the streets of Berlin; there were also the many ghosts of the Nazi tyranny that dominated the city for so long. Whilst it rebuilds itself into a 21st century city, Berlin is trying to memorialize and come to terms with its past. “Empire, war and revolution, democracy, fascism, Stalinism and the Cold war, all were played out here”, (Huyssen 2003: 53). The city still contains evidence of its recent history for all to see; the huge and imposing Nazi ministerial buildings still standing in Berlin, the bullet scarred architecture, as well as the secret torture chambers and the scenes of executions, now so often anonymous shops on the side streets of the city. 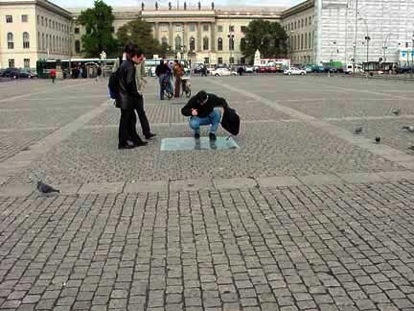 There are the sites of Nazi aggression and defiance such as Bebelplatz, where famously the “burning of the books” took place in 1933 as well as the recent addition of the “Stumbling Stones”; stones set into the pavements to mark the lives of individuals murdered by the Nazis, (Jordan 2006: 21). The Wall had a huge effect on the way that the city’s twentieth century history was memorialized. This most renowned piece of Cold War material culture directly affected the way that Second World War material culture was portrayed. The start of the Cold War so soon after 1945 and focus on Berlin as the centre of the second half of the 20th century’s global struggles ensured that the processes of memory, architectural renewal and healing did not progress, as they perhaps should have done. The rise of the Wall did not put a stop to the remembrance of the Second World War; simply things progressed at a different pace and with a different focus in the city’s to halves, (Jordan 2006: 42). With the first real generational change since the end of the Second World War, both sides of the city saw a “decentralization of the responsibilities for commemorative activities, including memorials, plaques, publications and events”, (Jordan 2006: 36), allowing public opinion and pressure to have more effect. The politicians often seized upon this public opinion and the memorial landscape of Berlin became another theatre in which to wage the Cold War, (Jordan 2006: 36). While the Wall was in situ both sides made great efforts in terms of their memorial culture and both sides had difficulties in memorializing the holocaust, (Jordan 2006: 35). The eastern side focused on resistance to Nazi tyranny, where as the Western side focused on the tyranny itself, (Jordan 2006: 31). “Collective memory operates within economic, physical and political limits”, (Jordan 2006: 2) and it is never inevitable that a site will become a memorial. In order for it to do so it must become a focus of political or public attention and be elevated to a status where it can no longer be ignored. The actual memorial sites do not change physically; simply the context and political will to do something to preserve them does. Countless examples of this can be found in Berlin, on both sides of the divide. Not all the sites of Nazi tyranny have been saved for posterity; indeed many have simply faded into the urban fabric of the city. However, as public pressure began to grow, the better-known sites began to be remembered and efforts were made to memorialize them. At Bebelplatz, the scene of Goebbels’ frenzied book burning in 1933, this desire to remember came to the fore. The literary bonfire eventually burnt out leaving nothing but ashes to mark the location, let alone anything for an archaeologist to find decades later and after the war the site became a public car park and the location of anti-fascist marches, (Jordan 2006: 98). Years passed without any mention of the site, or complaints about its use and nothing marked the location out as one of the most culturally destructive events in the history of Berlin, (Jordan 2006: 98). The fading in collective memory of places such as Bebelplatz was common on both sides of the wall. In 1983 the first official marker of the events of May 1933 was erected in the square. The message reads, “On this plaza Nazi brutishness destroyed the best works of German and world literature. The fascist book-burning of May 10, 1933 should be an eternal reminder to be vigilant against imperialism and war”, (Neil 2004: 51). It was not until 1987 that larger plans emerged for the site, an oversized, bronze heroic statue was planned for the square, to mark the Socialist victory over Fascism, fitting squarely with the East German approach to highlighting the past of the city, (Jordan 2006: 100), if not particularly representative of the original event. Once the Wall fell, these plans were abandoned and in 1993 the Senate and district government of Mitte announced there would be a competition for a new memorial on the site, (Jordan 2006: 102). 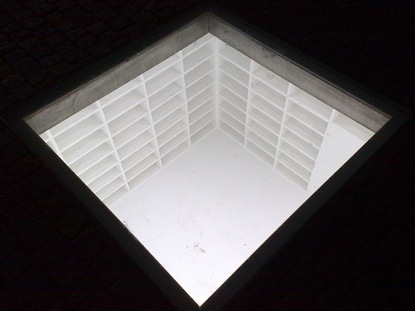 The winning design was by Micha Ullmann, an Israeli designer and consisted of a subterranean room beneath the square (See Fig 6 and 7). The walls of the room were to be covered in bare shelves, where 20,000 books could have sat, if they hadn’t been incinerated. The cornerstone was laid in July 1994, with the memorial being completed in March 1995, (Jordan 2006: 103). While the city was divided the East German Government’s focus was often on remembering the greatness of the East German and Soviet states’ and their victory over the Nazis, rather than of the actual events that occurred. Once the city was reunited again there was a greater significance given to the actual event and how it should be preserved for future generations and the memorial at Bebelplatz highlights this well. The Topography of Terror memorial in West Berlin was intended to focus on the victims of Nazi persecution (See Fig 8). “The exhibition established during the 1980s on the site of the Gestapo and SS headquarters is perhaps the most self-conscious attempt to uncover the historical legacy of a particular place in Berlin”, (Ladd 1998: 154). The memorial is on the site of the former Gestapo headquarters, housed at the Prinz Albrecht building, which was excavated during the late 1970’s and early 1980’s. The site is a permanent outdoor exhibition and as can be seen in Fig 8, the memorial butted up against the Western Wall. The history of the Wall has directly affected the memorial as whilst the Wall was in situ, it was located on the Western edge of West Berlin and since the fall of the Wall it is now located in the heart of the reunified city, (See Ladd 1998 and Jordan 2006). Like so much of Berlin, the original buildings were badly damaged during the war and this once-feared address became one of many stretches of neglected ruins during the immediate postwar years, (Ladd 1998: 157). Interestingly, due to the extent to which the building was destroyed, the U.S. Army had trouble distinguishing it as the SS and Gestapo headquarters and in its published guide to the city it showed a photograph of another building instead. But the building shown was actually the former Prussian House of Deputies, which stood across the street (and hence in the Soviet sector), (Ladd 1998: 157). 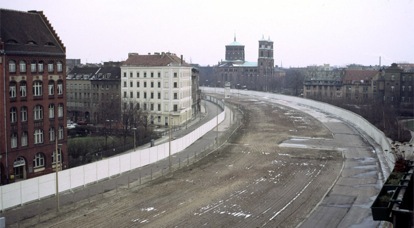 After the rise of the Wall the site faded into obscurity until the 1970’s when a group of local scholars and activists began to accuse the city of denying its roots in the Third Reich and the site was brought back to the public attention, (Ladd 1998: 158). In 1987 the city government agreed to sponsor a provisional exhibition on the history of the Prinz Albrecht building. A simple, temporary building was erected to house the exhibition, “next to the Gestapo cells and only a few steps from the Gropius-Bau’s entrance”, (Ladd 1998: 160). 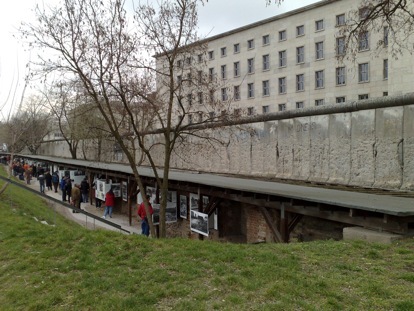 Between 1987 and 1997 1.5 million people visited the exhibition, (Jordan 2006: 51), and so the memorial site was transferred to the custody of The Topography of Terror Foundation and given permanent status. It must be said that the land that the memorial occupies is on prime real estate in the heart of Berlin. Had the memorial not been erected, albeit temporarily, before the fall of the Wall, its future might not have been so assured, (Jordan 2006: 51). The Topography of Terror site shows the Western half of Berlin’s attitude to the city’s Nazi past. The site is “authentic”, marks a painful chapter in the history of the city and highlights the memory and plight of the victims of Nazi terror. Not everyone agreed with the memorial, some saw it as “focusing too much on the victims and not enough on the perpetrators”, (Matus V 2001: 61). Since the reunification of Berlin further more combined and concerted efforts have been made to face the National Socialist past of Germany. Often during the tenure of the Wall the actual memorial itself took precedence over the act it remembered. The Holocaust Memorial indicates the way in which the remembrance of the Second World War might have gone if the city had not been divided. “The Memorial for the Murdered Jews of Europe”, as it is known, was extremely controversial to create, (See Jordan 2006: 120-127). But created it was and it serves not only to remember the murder of millions, but also as a sober reminder that Germany needs to come to terms with it’s twentieth century past; together, as one country. It is doubtful that anything like this could have been built while the city was divided and as the German politician Norbert Lammerts stated at its conception, ‘No memorial can give adequate expression to an unparalleled crime and an unimaginable occurrence in German history. The fact that the memorial is built will be more important than the form it takes”, (Niven B 2002: 194) – a mark of the different approach to memorials since the fall of the Wall. It is important to state that although the two sides of the city took different approaches to the subject of remembrance, both sides actively did seek to deal with the Second World War in their own way, as opposed to ignoring it. The Wall has now gone and almost all trace of it has vanished, much of it having been chipped away and sold as souvenirs, or objects of remembrance to those that were affected by its existence. Parallels can be drawn with the Trench Art of the First World War: Items of war detritus remodeled and sold, allowing the sellers to support themselves after the fall of the Wall and the buyers to take away a piece of history, or an object with which to remember the personal consequences of the divide. The question of how to memorialize the Wall itself is presently at the fore. In Germany today there is a whole new generation that were not alive when the wall was in situ. For them it must be hard to believe that the place they inhabit was once split down the middle and that more than a hundred people were murdered for simply trying to cross from the east of the city to the west, As Schofield states, “Although, or perhaps because, most of it has vanished, the Wall is, amongst many other things, not only a tourist attraction, but also the symbol of a political system that was overcome by a peaceful revolution”, (Schofield et al 2006: 22) and its legacies must be preserved. Kennedy famously said that, “All free men, wherever they may live, are citizens of Berlin”, (Becker-Cantarino 1996: 15). The city and the Wall became a metaphor for the divisions in the world and for the fact that that the wounds of the Second World War had still not healed. The division of the city had huge repercussions for Berlin and Germany. Not only was the urban landscape of the city torn apart, but also the Nazi past still lingered and there was no formal and united approach to coming to terms with it. Both halves of the city were keen to try and deal with the Second World War, but the approaches that were taken were more often than not ones that sought to highlight the political beliefs of the respective sides, as opposed to healing the collective guilt of the country. The Wall through Berlin did not only alter the physical landscape of the city. It also altered the mental landscape of the people that lived there. By the building of a divide that could not be looked over, it ensured that a mental landscape was built up in the minds of the city’s inhabitants. Propaganda, corruption, architecture, remembrance and fear were used as weapons to influence the beliefs of the city’s residents and fuel the Cold War. Today there is an ever-increasing rise in nostalgia for the GDR. As recession grips Europe and capitalism struggles to take route in the East, the persecution and loss of liberty that the Berlin wall ensured is being marginalized, ironically helped by the disappearance of the Wall’s last traces, and the efforts being made to repair the landscape of the city. Berlin is busy trying to heal yet another scar on a city that already bears so many, but with its rich and complex history of division, the question remains as to whether the city will be able to mend these wounds before fresh ones are opened by the next physical or metaphorical “wall” to be built in the city. Becker-Cantarino, B. (1996). Berlin in Focus: Cultural Transformations in Germany. Praeger Publishers: Westport, CT.
Bevan, R. (2006). The Destruction of Memory: Architecture at War. Reaktion Books: London. Grant, R, G. (1991). The Rise and Fall of The Berlin Wall. Magna Books Ltd: Leicester. Heller, D and D. (1964). The Berlin Wall. Cox and Wyman: London. Hilton, C. (2009). After The Berlin Wall: Putting Two Germanys Back Together Again. The History Press: Stroud. Hertle, H. (2008). The Berlin Wall – Monument of The Cold War. Christoph Links Verlag: Berlin. Huyssen, A. (2003). Present Pasts: Urban Palimpsests and the Politics of Memory. Stanford University Press: Stanford. Jordan, J. (2006). Structures of Memory, Understanding Urban Change in Berlin and Beyond. Stanford University Press: Stanford. Ladd, B. (1998). The Ghosts of Berlin: Confronting German History in the Urban Landscape. University Of Chicago Press: Chicago. Lansing Dulles, E. (1967). Berlin: The Wall Is Not Forever. University of North Carolina Press: Chapel Hill, NC. Neill, W, J. (2004). Urban Planning and Cultural Identity. Routledge: New York. Niven, B. (2002). Facing the Nazi Past: United Germany and the Legacy of the Third Reich. Routledge: New York. Saunders, N, J. (ed). (2004). Matters of Conflict, Material culture, memory and the First World War. Routledge: London. Schofield, J. Klausmeier, A and Purbrick, L .(2006). Re-Mapping the Field: New Approaches in Conflict Archaeology. Westkreuz-Verlag: Berlin. Taylor, F. (2007). The Berlin Wall. Bloomsbury Publishing: London. Matus, V. (2001). The Once and Future Berlin. Policy Review. 2001. Heritage Foundation; COPYRIGHT 2002: Gale Group.